Wipaq provides your business with the latest timekeeping technology that is trendy and compact. No matter how you plan time, there always remains a loose thread and managing this is quite a task. 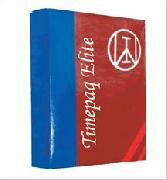 But not anymore as the Timepaq elite has all the added features of timekeeping, record keeping, data management, and all the much needed time data for future reference. It gives the technologically advanced time punch options, attendance system management and time sheets are all managed inefficient software where there is little room for things to go wrong. 111, Dar Al Wuheida Building, Al Wuheida St, Hor Al Anz East, Dubai.